It hasn’t taken long for Chicago Mayor Richard Daley to make clear his intentions to push the limit on how the Windy City is going to respond now that the Supreme Court has essentially sounded the death knell for the city’s 28-year-old handgun ban. McDonald v. Chicago was a landmark victory for the Bellevue, WA-based Second Amendment Foundation for sure, but it was also a win for gun rights all over the United States because it incorporated the Second Amendment of the Bill of Rights to apply as a limit on state and local governments. Chicago’s Corporation Counsel, Mara Georges, made it clear that the city is going to furiously fight to discourage as many of its citizens as possible. 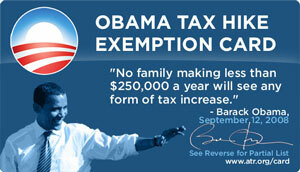 The Obama Tax Hike Exemption Card!!! You may have noticed that President Obama has broken his central campaign promise – a “firm pledge” that Americans making less than $250,000 would not see “any form of tax increase.” He first broke this pledge sixteen days into his presidency when he signed a 156 percent increase in the federal excise tax on tobacco. And Obamacare contains 21 tax increases – several of which violate his “firm pledge”. 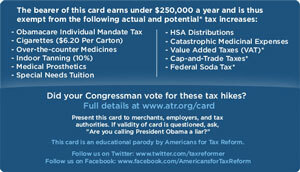 To protect you from these tax hikes, Americans for Tax Reform presents the “Obama Tax Hike Exemption Card”. The card fits neatly in your wallet and contains a list of the tax hikes signed into law by President Obama that violate his tax pledge, as well as a few other taxes that have been threatened: a European-style Value-Added Tax, Cap and Trade taxes, and even a federal soda tax. Step 1: Present the card to merchants, employers, and tax authorities. BELLEVUE, WA – The Second Amendment Foundation on Monday filed a federal lawsuit in North Carolina, seeking a permanent injunction against the governor, local officials and local governments from declaring states of emergency under which private citizens are prohibited from exercising their right to bear arms. Joining SAF in this lawsuit are Grass Roots North Carolina – the state’s leading gun rights organization, and three private citizens, Michael Bateman, Virgil Green and Forrest Minges, Jr. Named as defendants in the federal lawsuit are North Carolina Gov. Beverly Perdue; Reuben Young, secretary of the Department of Crime Control and Public Safety; Stokes County and the City of King. The lawsuit was filed in U.S. District Court for the Eastern District of North Carolina. The lawsuit contends that state statutes that forbid the carrying of firearms and ammunition during declared states of emergency are unconstitutional. Plaintiffs also contend that a North Carolina law that allows government officials to prohibit the purchase, sale and possession of firearms and ammunition are also unconstitutional because they forbid the exercise of Second Amendment rights as affirmed by Monday’s Supreme Court ruling in McDonald v. City of Chicago, the landmark Second Amendment ruling that incorporated the Second Amendment to the states. SAF and the Illinois State Rifle Association took the McDonald Case to the Supreme Court. SAF is once again being represented by attorney Alan Gura, who led the legal effort in the McDonald case and also won the historic Heller ruling that overturned the District of Columbia handgun ban in 2008. Local counsel are Andrew Tripp and Kearns Davis with the firm of Brooks, Pierce, McLendon, Humphrey & Leonard, LLC in Raleigh. The hearings on Elena Kagan — President Obama’s radical pick to join the U.S. Supreme Court — began yesterday. This is a VERY IMPORTANT battle that gun owners must fight, as evidenced by the slim victory in the McDonald v. Chicago case that was handed down by the high Court yesterday. Yikes… the Supreme Court is no place for on-the-job training! While two key Republican senators (Kyl and McConnell) had previously indicated that there would not be a filibuster of her nomination, Sen. McConnell seemed to open the door yesterday for such an action. That’s why all Senators (especially the Republicans!) need to hear from you during this confirmation battle. Note: Bill Olson, the Gun Owners Foundation attorney who spearheaded our amicus brief before the Court in the Chicago case, is scheduled to testify before the Judiciary Committee in opposition to Elena Kagan later this week. By the way, Justice Sonia Sotomayor’s confirmation last year should now shed some important light on the Kagan hearings. McDonald v. Chicago is the first Second Amendment case that Sotomayor has dealt with as a Supreme Court Justice. It’s no surprise that she joined the anti-gun dissenters, but it highlights what a sham the judicial hearings are — and how Senators should put no stock in a nominee’s responses. Sotomayor responded: “Yes, Sir.” In other words, she affirmed with her response that the right to keep and bear arms was a fundamental, individual right. Most people would say she lied to Senator Leahy and said whatever she needed to say to get confirmed… which is why Senators need to HEAVILY LOOK at Kagan’s record, not only in what she might say during these hearings. ACTION: Please… please… please… contact your Senators and urge them to oppose Elena Kagan for the U.S. Supreme Court. You can use the Gun Owners Legislative Action Center at http://www.gunowners.org/activism.htm to send a pre-written message to your Senators. * Kagan was also part of the Clinton team that pushed the firearms industry to include gun locks with all gun purchases and was in the Clinton administration when the president pushed legislation that would close down gun shows. Most people would say she lied to Senator Leahy and said whatever she needed to say to get confirmed… which is why Senators need to LOOK CLOSELY at Kagan’s record, not what she might blabber during these hearings. Please oppose the Kagan nomination. 24] and now moves to the floor. certain countries under a declared national emergency. of policing the web with censorship and coercion. the federal government the power to completely shut it down. down the Internet. And this is exactly what Lieberman’s bill does. believe this is why God provided the Holy Scriptures and the Holy Spirit. And I for one do not need the federal government to try and replace either. to become Big Momma and Big Daddy as well? is able to travel, thanks to the Internet. clarion call for liberty and independence at the time of America’s founding. the federal government with the power and authority to shut it down at will. of the free!” As if they are blameless in freedom’s demise. critical that the Internet remains absolutely and totally free. For too long we have been too complacent about the workings of Congress. Many citizens had no idea that members of Congress could retire with the same pay after only one term, that they specifically exempted themselves from many of the laws they have passed (such as being exempt from any fear of prosecution for sexual harassment) while ordinary citizens must live under those laws. The latest was to exempt themselves from the Healthcare Reform … in all of its forms. Somehow, that doesn’t seem logical. We do not have an elite that is above the law. I truly don’t care if they are Democrat, Republican, Independent or whatever. The self-serving must stop. A Constitutional Convention – this is a good way to do that. It is an idea whose time has come. I see Skip Coryell and his crew with the “Second Amendment March” are cooking up another scam for all of us to donate our hard earned money to line their pockets this year. Trying to work with them last year was an absoloute NIGHTMARE. Let me tell you why….. When I saw the announcement of their plan to hold a nationwide Second Amendment March I was excited about it and contacted them in the beginning of January 2010 in order to find out how I can assist their effort in my State. Being a strategist AND a Second Amendment Advocate, I felt I had a lot to offer to their effort. I wrote numerous emails to their so-called “State Coordinator” and received no acknowledgement whatsoever. After a few weeks of writing emails, I decided to write to Skip Coryell and a few of the other “founders” of the event. In my letter to them, I explained that I would be willing to do anything and everything required to hold the event in my state, but that I wouldn’t feel comfortable soliciting funds. I don’t like asking people for money. I was very clear in my emails to them that I was willing to do everything BUT raising funds. After several days, I finally received a response to my email. I was told that all they wanted me to do was SOLICIT FUNDS. It was as if they didn’t even read my email. I wrote back a few times asking what else I could do and if they had secured the permits and had the logistical planning done and received the same response. Solicit funds. That was all. As someone who has coordinated several large events, I was nervous that they hadn’t done any planning and hadn’t gotten the necessary permits, but I went ahead and posted the event all over the internet on forums and my blog in order to ensure donations and attendance. As we got closer to the date, I sent email offering to take the role of state coordinator and asking about logistics. My pleas for information were ignored by the people at the “Second Amendment March” organization so I just continued getting the word out, hoping that they we doing the proper planning. The event in my state was originally scheduled for April 19, 2010 and I had a large Tax Day TEA Party on the 15th to help coordinate. I was also in the process of moving out of state, so things were pretty hectic. I was one of the speakers at two Tax Day TEA Parties in my state. While at one of those events, I was approached by a very nice gentleman from www.OpenCarry.org asking me if I would help plan the Second Amendment March. Apparently it had been rescheduled for April 24th, so we had 9 days to plan everything, including securing the permit. I begrudgingly accepted the challenge and we got to work planning. After several inquiries about how much money we would be alloted for our state event, we were told that we would receive NONE of the funds collected from our state and that we had to pay for everything ourselves. Needless to say, this was quite upsetting to us because we had been working for months to help them collect funds. I am fairly certain some of the funds they received were from our state and I felt we were entitled to use those funds for our event. One gentleman secured the permit and paid for it out of his own pocket. The gentleman with www.opencarry.org secured funds from that group by posting a gunpal donation button on a few forums and we were able to collect donations of snacks, coffee, sodas and (really nice) free giveaways as well as a podium, sound system, tables and banners. We recruited help and an MC for the event. All of this was done in less than NINE DAYS, with absoloutely NO HELP from Skip Coryell and the other people at the “Second Amendment March”. By the way…. if you haven’t been to the www.opencarry.org forum, please take a look. They’re a tight knit group and the forum is filled with very useful information related to open carrying. Our event on the 24th went extremely well, even though the weather didn’t cooperate. It poured down rain and was extremely windy, and it was also scheduled on the same day as a major gun show in the area and some hunting events. In spite of those issues, we had a good turnout and logistically everything went very smoothly. After the event, Skip Coryell and his crew tried to swoop in and take credit for all the work that WE did. I decided to let it go because it was over and done with, but now I see they are sending out more emails to solicit money from everyone and that they are promoting another event, “America’s Victory Shoot”. They’ve suckered a group called “Lucky Gunner” to co-sponsor them and they’re advertising a new scam. Well, I’m here to tell you that these guys are SCAMMERS. They seem to be in this only for the money, which makes them bad guys in my opinion. Should you participate in their events? I don’t know. Do what you want. The efforts to protect our Second Amendment Rights are greater than our personal opinions. Should you donate your hard earned money to these guys? HELL NO. And to the people at the “Second Amendment March”……. We’re onto you. We know what you’re all about, and I’m not going to let you get away with your scam this time. There are NO SECOND CHANCES with me. Screw me once, shame on you. There will be no second opportunity to screw me again. Bet on that.